International Sales Showbox / Mediaplex, Inc.
Production Dasepo Club, Showbox / Mediaplex, Inc. Thanks to omy.sg and GV (Golden Village), I had the opportunity to attend the movie preview. Confession of Murder is based on a real murder that took pace about 27 years ago that has never been solved with its statute of limitations having expired: between September 15, 1986 and April 3, 1991, 10 women were bound, raped and killed in the city of Hwasung. Through this film, its mystery has resurfaced to public attention after being dealt with in BONG Joon-ho’s seminal. With a title like "Confession of Murder" and the genre labeled as "Action Thriller", I was half expecting gruesome scenes like those from The Man from Nowhere with a darker undertone. But I was pleasantly surprised that it was not as dark as I expected, with only tinges of dark overtones with a little dark humor to boot (there were many instances throughout the movie that were both hilarious yet thrillingly action packed). There were many well choreographed action scenes throughout the movie as well: two figures having a go at each other in the pouring rain in the dark, a high-speed car chase with abductors and abductee climbing over each other and cars, and the icing on the cake where instead of trying to stay safe and alive, people are trying to outdo each other by trying to run each other over with vehicles – the bigger the better it seems. JUNG Byung-gil’s directing style is slightly different from other movies I have seen, and takes a little getting used to. 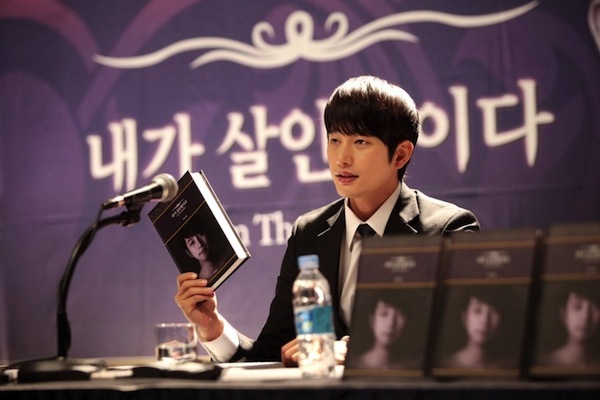 However, it can be slightly confusing for people who are not used to and cannot keep up with the storyline through the use of unique camera angles that accompany flashbacks and thoughts for the main protagonist, Choi Hyung-gu, the primary detective on the case. The antagonist, Lee Du-seok, is an interesting character, his auto-biography on the murders reveals a name and face to his identity and crimes to society. He actually becomes as famous as a celebrity just because he evaded the law, confessed to the murders after the statute of limitations had expired (thus rendering him “innocent”) by writing a book to atone for his crime and is truly remorseful… or is he? As the movie progresses, Du-seok’s disturbing autobiography becomes a bestseller and he even gains a rather large (and outlandish) fan following of (young) women who are proud of him being the killer and admire him solely for his good looks and charms. In what seems like a calculated publicity campaign, he begs forgiveness of the victims' family members, seemingly repentant (but whether this is part of his publicity stunt or acting out his true feelings are known only to him). He also has the ability to get under Hyeong-gu’s skin and frustrate him since Hyeong-gu who powerless to arrest Du-seok for the crimes. Though the premise of Du-seok’s popularity may seem to be bordering on the absurd, it does reflect (in an extreme) way how influential the media is and/or how people can be so caught up in (and thriving on the misfortune of others) the world of chasing after celebrities/idols that even if it is a morbid (or maybe deep down humans are innately attracted to such things) subject matter. Anyways, with his identity made known, members of the victims’ families kidnap Du-seok and attempt to escape with him to extract their revenge. It’s an elaborate plan which results in an intense cat-and-mouse game that’s played right on highway between high-speed cars. Overall, it was an enjoyable movie and was nicer than I had expected – it was not as angsty and revenge focused as I thought it’d be given the trailer and title. Throughout the movie, Hyeong-gu was portrayed as the rash, impulsive, and hot tempered detective tying to nail the cool and composed Du-seok, who seems to counter Hyeong-gu's every move. The ending had a surprisingly (or not so a surprise if you are one of those who actually thinks a lot during a movie and mange to figure it out) twist which I had not really expected. Even if the ending might (not) surprise you, the action scenes and dark humor (at intervals) are worth watching (though there is constant swearing in Korean, which I guess is why it is rated NC16). If you have watched it, what was your impression? 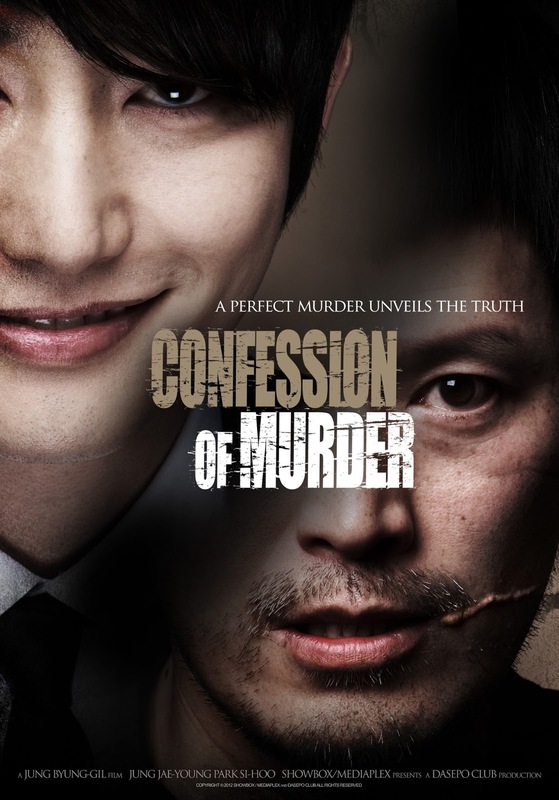 Confession of Murder shows in cinemas on 14 March 2013 and is rated NC16.